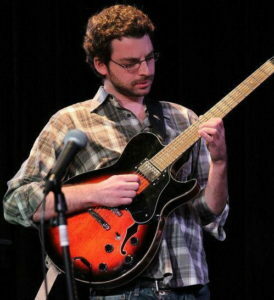 Originally from Philadelphia, Pennsylvania, Matt was self-taught in bass guitar and drum set before studying guitar at the Settlement Music School in Jenkintown, PA and the Music Training Center in Philadelphia, PA.
After moving to Arizona, Matt studied jazz guitar, drum set, improvisation, composition and music theory at Mesa Community College while serving as the on-campus music theory tutor. Following his studies at MCC, Matt was accepted into the Arizona State University School of Music and earned his degree in Jazz Guitar Performance. Matt’s musical styles include jazz, rock, blues, funk and pop. He has performed with a variety rock bands, jazz groups, duets, guitar ensembles, big bands and as a soloist throughout the East Valley. He has performed the music of artists from Duke Ellington and Count Basie to Jimi Hendrix and Jeff Beck as well as composing his own original music. Matt also provides recording session performances for the audio production program at Mesa Community College while constantly building on his own recording studio techniques and personally produced music. Matt has been teaching guitar, bass guitar and drum set in the East Valley for several years. Although he is a dedicated musician, composer and performer he is equally dedicated to being a highly effective teacher for students of all ages and ability levels. Matt has studied with many great music educators and has learned not only to become a great musician but a great instructor as well. Guitar, Bass Guitar and Drum Set Lessons with experienced musician and instructor Matt Friedland. Conveniently located in Gilbert, AZ 85296. Call Today!